Replies: 51 (Who? ), Viewed: 9722 times. #1 20th Jul 2018 at 10:57 AM Last edited by billielith : 12th Apr 2019 at 12:58 AM. I have started working on a new sim, and would like your suggestions to improve him, please. Care to help me? 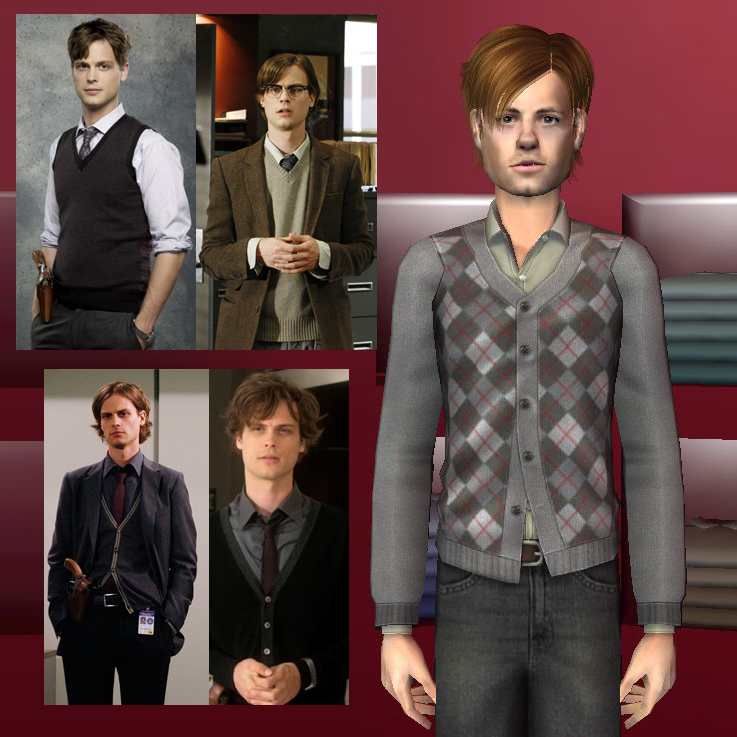 It's Dr. Spencer Reid from TV Show Criminal Minds. #2 4th Aug 2018 at 3:46 AM Last edited by billielith : 4th Aug 2018 at 4:01 AM. No response, no reaction, nothing. Does it mean nobody knows this character or this series? 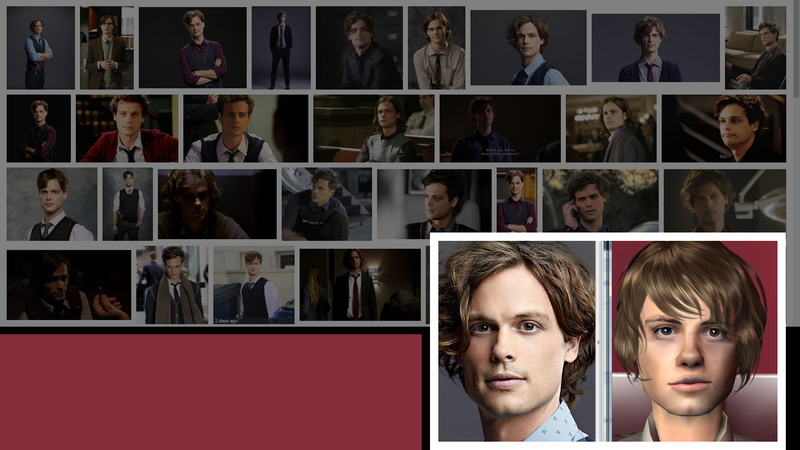 If that is the case, it's too bad, because Criminal Minds is fantastic. 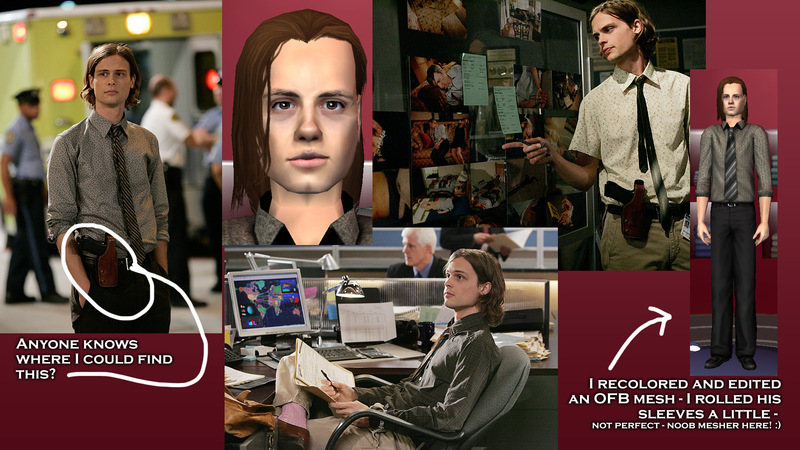 And Dr. Reid is awesome. 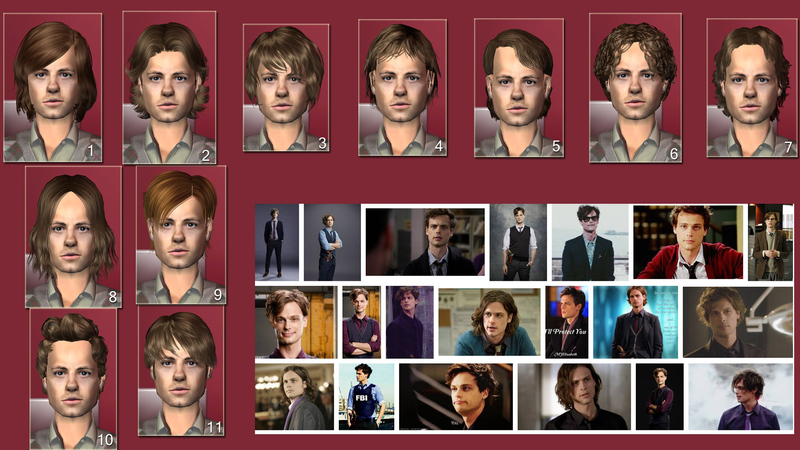 Meanwhile, I got my disk copy of M&G and tried the curly hair style on him (#6), then I went online to get different styles. 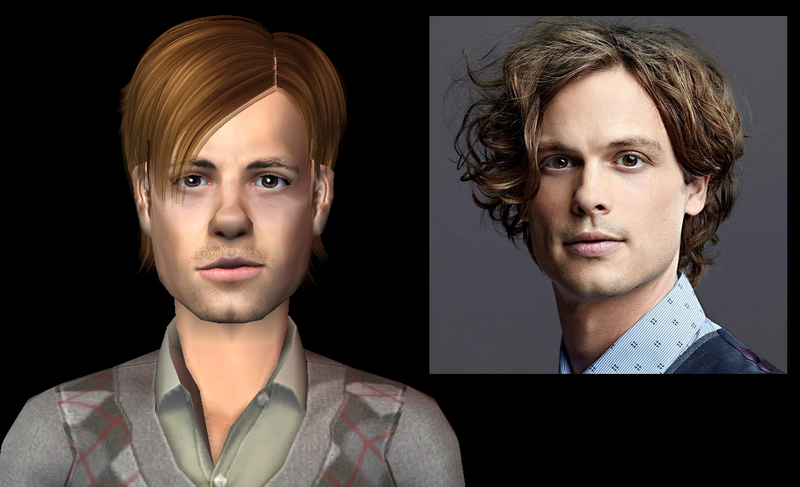 His hair is different every day (source pictures), yet it has something clumsy and natural about it that I am trying to give to the sim, with the styles I have found. Which one do you think would be the most appropriate? I hesitate between 2, 4, 5, 8, 9 and 11. What do you think? And what do you think of the face? Do I have it right? I guess I need better pictures but it's hard to find a picture of him truly facing us with no expression. I hope there is at least 1 person who can feel some curiosity or interest in this. I'd really like another person's opinion. Thanks! Okay, I'm not good at this, but someone needs to appreciate your hard work. I really like what you have done with his face. It's hard, because, like you said, we hardly get to see him facing the camera with a neutral expression. Despite that, you managed to make it work. My only complaint is that he looks a little older than he is supposed to ? 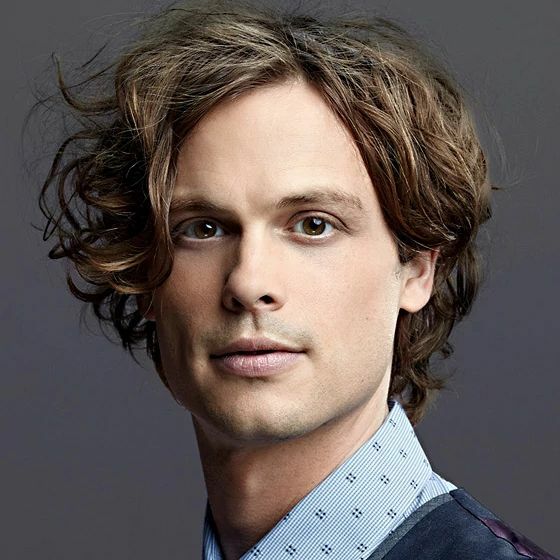 I always see him as a young guy, and here he looks like he is in his mid-30s, which is okay, and you have done a great job, but...As for the hair, I think no 2 suits him. Good luck, and I hope this thread gets more response!! I'm not familiar with the character, but it's clear you have a very good likeness going! Weirdly, I actually get a sense of compassion and empathy from the sim (which, no idea if that fits the character at all, but that's my two cents). If I were to make one suggestion it would be to try widening his eyes a little bit... not side to side but open them up a touch rounder. Did you do that already for the second batch? Might look a little different in the eyes, or maybe it's just the distance. The hair is a tricky one. 3 is pretty good. 7 is close, but it leaves a lot of forehead real estate. I personally like 11 best. 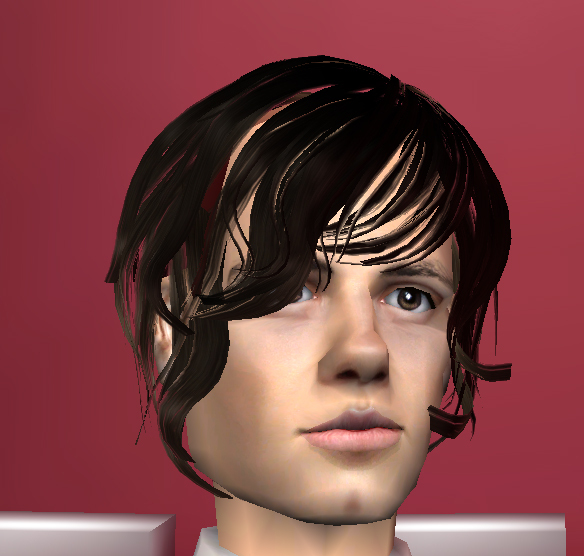 It's not a perfect match or anything, but it's longish and has some flow and bangs without pulling focus from the face. Six looks the most natural to me, and has the advantage of not being CC. In any case, it needs to be something with the hair falling down over the forehead a little. The face looks too long if the forehead's visible up to the roots. One has the part in almost exactly the right place, but it's too neat. He always looks as if he fell out of bed, combed his hair with his fingers, and then forgot about it. 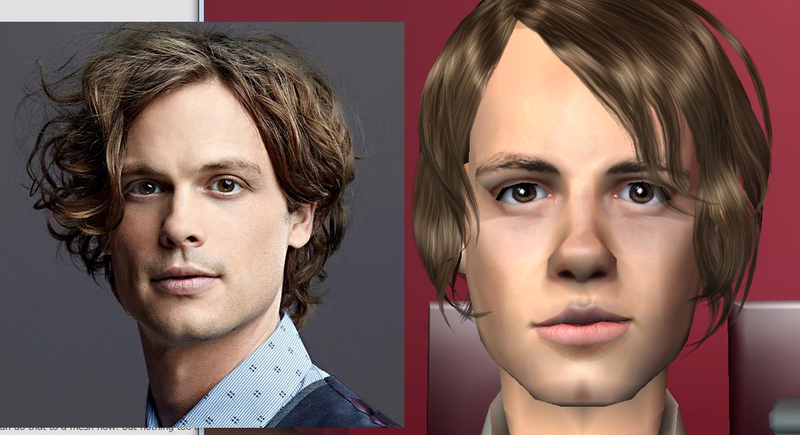 I'm terrible at making sims, so I'm not good at suggestions for face sculpting, but I think he has quite the likeness of the character! 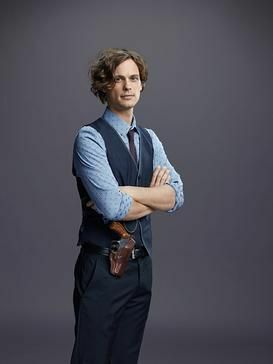 I too love Criminal Minds, just waiting for the last season to come on Netflix. I agree with Peni that six looks the closest to his hair. I think seven could have possibilities, if only it flopped over the forehead more. Maybe the bridge of the nose needs to be slimmer plus the cheekbones back a bit - or higher and further apart? Difficult to tell without a side shot. #8 6th Aug 2018 at 6:28 PM Last edited by billielith : 11th Aug 2018 at 10:24 PM. pannisim, Liz, Peni Griffin, HugeLunatic and Maxon, hi, and thanks for chiming in! I agree. I will remove some of the wrinkles and other effects. Compassion and empathy both make a lot of sense! Rounder eyes should help. I agree with your suggestions regarding the hair. I agree with your hair choices. And he indeed looks as if he fell out of bed and didn't really care much about it, lol. I agree. I think I do need better source pictures. and I tried the new face with the hairstyles that were mentioned. 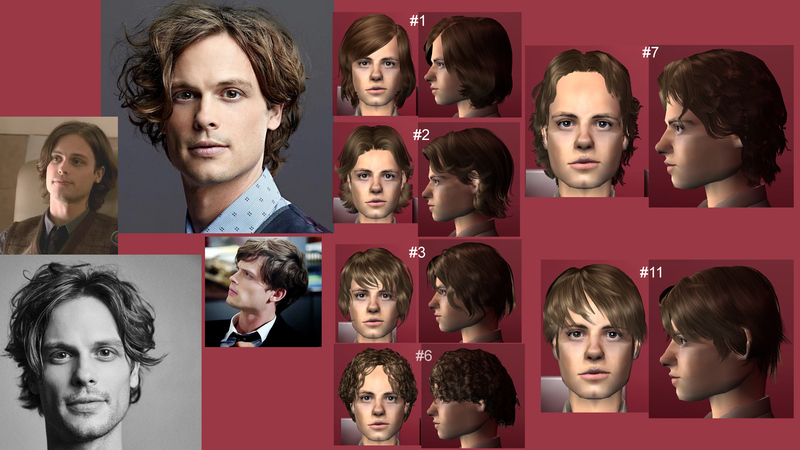 I also found a small picture where we see him from the side, plus I took pictures of the sim from the side as well. I love the change in the eyes! That's better for the nose - with the sliders you have, can you flair out the nostrils a little more - wider at the base of the nose. And dimple in the corners of the lips - there is a slider for that somewhere I think. Really good job there! As I like my Sims "caricaturized". He would look strange in my hood. Great job though! Nice looking Sim! How did you get the mouth to tilt uneven? Nice effect! #12 11th Aug 2018 at 10:06 PM Last edited by billielith : 11th Aug 2018 at 10:23 PM. Thanks! Are they too round now? I feel like there's still something wrong with his eyes. He is so different from one pic to the other, it's difficult to see. Nose edited, mouth edited. I thought I had all the sliders. I went back and got the 'Late for the party', hoping they would help for those dimples. The sliders give him a smirk he does not have, but by combining the smirk sliders with other mouth sliders I kinda got to what I think is the right shape. What do you think? Thank you! If you like caricaturized sims, maybe you would like my Minecraft sims or my 'Otherworldly Foes'. Meanwhile, for tilting mouths unevenly and other oddballs on sim faces, check the blog with the sliders. Search 'Sims 2 Sliders' on Google - I did that just a moment ago to get the sliders Maxon mentioned. I made a choice regarding the hair. I went for one that was not too curly, not too straight, and not too symmetrical. What do you think? I am going to try to make it a bit more 'Reid-like'. He does not have so much bangs. I definitely don't think the eyes are too round. If there's one thing I note that's still not 100% matched it could be the tilt, and might be to be tricky to manage... The actor's eyes tilt down at the side, but it's his eyelid folding, not the eye itself, that slopes down. You might try a full eye rotate-tilt, just one notch, to see if that helps create the illusion, but I think the current roundness is good. #14 11th Aug 2018 at 10:49 PM Last edited by billielith : 11th Aug 2018 at 11:46 PM. Thanks so much Liz!! Full eye rotate tilt - just one little notch - was just the thing. I think we got him now. I have interviewed hundreds of killers. All types of crazy motives for doing what they did. They all share one thing in common, all of them: it's in their eyes! - David Rossi, Criminal Minds. He looks perfect!! The eyes, the nose, the mouth, you got all of these on point. And I like what you did with his hair. I don't know what you mean by horizontal flip, sounds tricky, but congratulations for learning to do that! I can't even di a simple recolor without it resembling garbage! But great job, he looks very cute! #17 12th Aug 2018 at 3:32 PM Last edited by billielith : 12th Aug 2018 at 4:50 PM. Hmm, apparently I don't know how to do it either, lol. My attempt did not work, I only had part of the mesh, not all of it - see the pic attached of my failure, lol - plus my alpha edit is gone. I will try it again later. I know exactly what you mean about bad recolors. Either you rework it, either you give up, lol. Sometimes, the more you work on something, the worse it gets, lol, but sometimes you get somewhere. Only one way to find out. Hi! Thanks for chiming in! And thanks again for telling me about the sliders the other day! You opened a whole new universe to me for sim-making. Mouth is narrower. Eyes are a bit deeper. Nice find! If anyone still finds something, please tell! 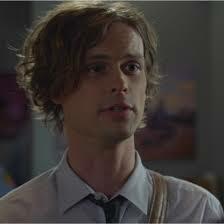 I tried and failed the horizontal flip of the hair, I'm going to be back working on Reid saturday morning (Aug. 18). Honestly, I don't like that eye rotation - personal opinion. Or moving the eyes back - brings in too many planes in his face for me. Maybe narrow the eyes a little instead? I see what you mean about the mouth and that's pretty good - I'm sure I've seen mouth dimples. But never mind. I think the bulb on the end of his nose could be one click smaller - again personal opinion. I agree the eyes look a little too deep now. It gives a shadow like his photo has, but the brows become too prominent. And I see the case both for and against the eyes being tilted -- maybe undo and just tilt the outer corner by one? Possibly widen the upper lip "pinch" by one or two? He does have a pinch, for sure, but on the sim its pinch gets slightly pointy and loses some of his nice fullness. Also agree with maxon about the nose. I know you've put so much work into the hair, so I hesitate to mention... but I'm gonna. What would you think of trying #6 above with some of the sim-left-side bangs trimmed away? (Did you already mention that?) I dislike that mesh as it is, just personally, but I think it might be a closer match if you're able to trim it a little. Honestly, it looks wonderful. We're all just trying to nitpick to help, but he looks amazing. Eye rotation removed, moving the eyes back removed, eyes a little more narrow, nose bulb one click smaller - thanks Maxon! As for the mouth dimples, I wish you could tell me which ones you mean! I have all the sliders from the tumblr except the pointy ears. I tried them all one by one, and am really not sure which one you mean, sorry if it should be obvious! Eye corners tilted by one, upper lip pinch fixed, thanks Liz! As for the hair, I tried to go for what you suggested, but apparently I can't trim curly hair correctly, it looked accidental and like bad work. 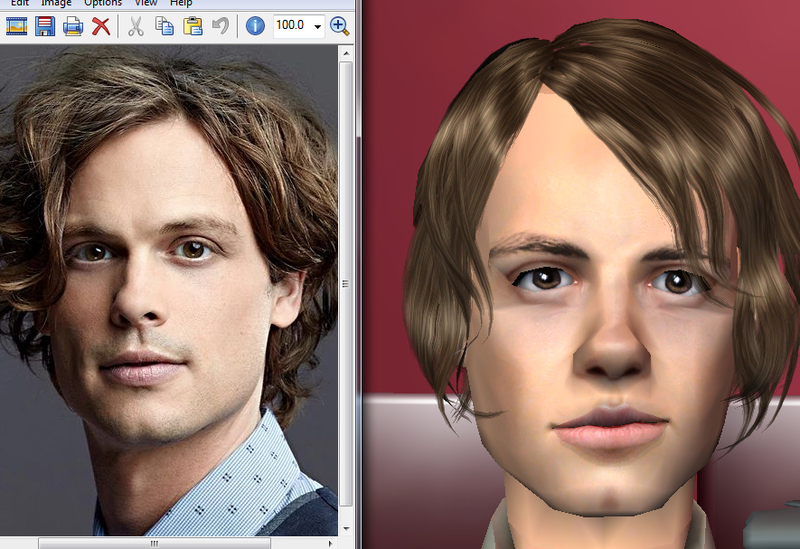 The more I tried the worse it got so I gave up - his hair is not all that curly anyway. The hair I picked before is not curly enough, I know! lol. We would need something in between. He changes styles a lot, this adds to the difficulty! From one pic to the other he is like the man with 1000 faces. Anyways here's the update for today- with hair #3 (not curly enough hair) and with #6 (curly curly hair). What do you think? Next update probably next sunday. He is looking so awesome! I personally prefer 3 to 6, but I'm not impartial there. Sorry the experiments with 6 weren't more fruitful -- all your sims are such labours of love! Ah that nose is looking pretty good. Eyes look better too IMO - though maybe just a little more closed (what is that - squint?)? Personally, I think the 6 hair is closer to the original but, as you say, neither is exactly right and 3 is a nicer hair (I don't like that curly style anyway). I really can't remember about the dimple slider - I might have mis-remembered. If you've looked at all the ones you can find, you're much better informed than I am. So we'll go with my faulty memory as a solution. #23 27th Aug 2018 at 5:48 AM Last edited by billielith : 27th Aug 2018 at 6:02 AM. Hi again all, thanks for following this! Liz, you are so sweet! I try. Maxon, you're always so helpful! His eyes squint a little more now, but not too much. I found some mouth dimples, but as make up; probably not the ones you meant. I tried yet another hairstyle, the one coming with OFB, color is off but I am sure AlmightyHat Pookleted it so it's not a problem. Should I try curling the bottom? I might just get him to the finish line with it. Recoloring and editing an OFB mesh I worked with before, I also made an outfit similar to what he is wearing in one of the pictures. I also added simenroute pockets under his eyes but I think they might be a bit too dark. What do you think? That shirt and tie is pretty nice! Good job there. If you could curl the hair, as you say, at the bottom that would work I think but he's pretty close now. It's particularly good because of the behind the ear thing. I have no idea about the holster and gun though I think there are some accessories out there. I was just wondering if this hair would do for him! It leaves the forehead slightly prominent, but there isn't going to be a perfect fit. I like this one -- it kind of represents several of his styles and lengths together. Excellent job on the shirt/slacks!